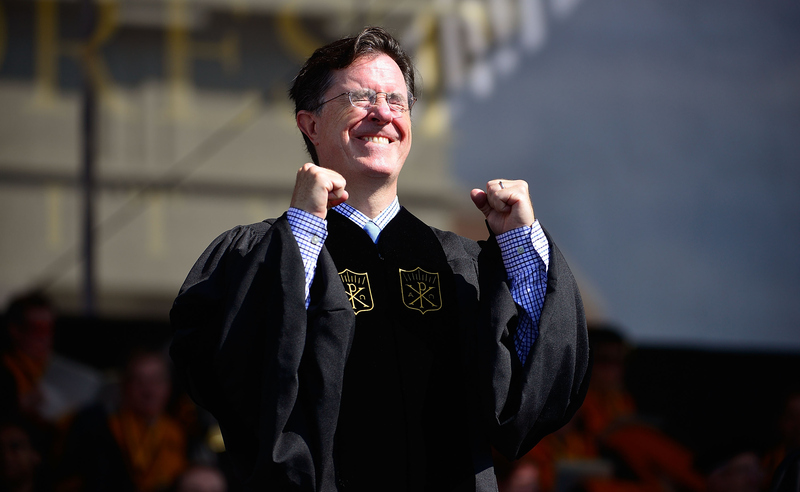 Fans of joy and happiness have been stoked ever since news broke that Stephen Colbert is set to replace David Letterman as host of The Late Show. Luckily, though we're still a couple months away from the premiere, there's been no shortage of promotional material for the comedian's upcoming role. Like this: Saturday, news broke that Stephen Colbert released a video game online in promotion for the show, and, of course, it's pretty hilarious. Many have been wondering how Colbert's humor would translate to the late night talk show format without the help of the faux-conservative pundit character he played on Colbert Report. If the jokes in this promo are any indication of the type of hilarity he has in store for late night, then we can all rest assured that he's going to do fine. If you play the game, however, you're going to want to see all the jokes — and, luckily, I have some tips on how to make that happen.The "video game," isn't so much a video game, per se, as it is an elaborate series of jokes hidden throughout a choose-your-own-adventure scenario. It's called Escape from the Man-Sized Cabinet, and can luckily be found right on The Late Show 's website. According to Vulture, it's designed as an homage to the '90s PC games developed by Tim Shafer. Mostly text-based, you play Stephen Colbert himself, and you're presented with different choices as you explore your office and, subsequently, the Narnia-esque kingdom you discover in the back of a closet. The whole thing takes like seven minutes to play, and I highly recommend exploring it. If seven minutes is way too much time to take out of your busy life, though, then here are some shortcuts to help you quickly uncover the funniest parts of the game. Tip #1: You're Stephen Colbert! And it feels just as good as I thought it would. The game starts with you — Stephen Colbert — roaming aimlessly around the halls of CBS because the show doesn't premiere for two months and your life is meaningless. So meaningless, in fact, that you start thinking you want to explore a "man-sized cabinet" in your office. Tip #2: Before You "Explore The Man-Sized Cabinet," Click On Regular Old "Man-Sized Cabinet"
It will allow you to explore the office, which will bring you to one of the funniest jokes in the game: Stephen Colbert's to-do list. Click on "to-do list..."
In addition to "Steal Christmas," the list is one classic Colbert joke after another, like "Save Cheerleader, World" and "See Entourage Movie Again." Once you're tasked out, it's time to go into the closet, where you are immediately trapped! At this point, you'll have several options, including breaking down the door, yelling for help, or standing in the closet for 8 hours. It comes up a few times, and it's one of the few ways to die in the game. Of course, the death is hilarious and it brings you back to the prior prompt screen anyway so it's no big deal. Select "another corporate holiday" and, once again, click through a list of hilarious Colbert jokes about fake corporate holidays, which include "Bring Your Work Home With You Day," "Gentleman's Extravaganza," and "Chaka Khannukah." Since that got you nowhere, now it's time to choose the only option that will move the game forward, which is trying to break down the door. Once that also gets you nowhere, you realize that the cabinet is deeper than you thought, and you start to explore. The cabinet leads to a forest, presumably of the magical variety, where you see a sleeping centaur. If you want to have the most hilarious experience of the game, then the general advice for this section is to do every option besides literally awakening the centaur. The game doesn't punish you, it just verbally berates you for wasting its time. Eventually, Randall tells you there's an evil wizard named Merlock terrorizing the land, gives you a magical candle, and you set out on a quest to defeat him. It's the one way to actually die that makes you start the whole game over. The next semi-hidden joke list in the game comes when you encounter Merlock. You have basically no choice but to stab him, but after you do you throw Randall's candle at him, he tries a series of spells, including "Water Lightning," "Business Spanish," and "Hiring A Social Media Person." His spells fail, the candle lights him on fire, and you make it back to your office, safe and sound, once again living your meaningless life until The Late Show premieres on Sept. 8.